MERV 8? MERV 11? 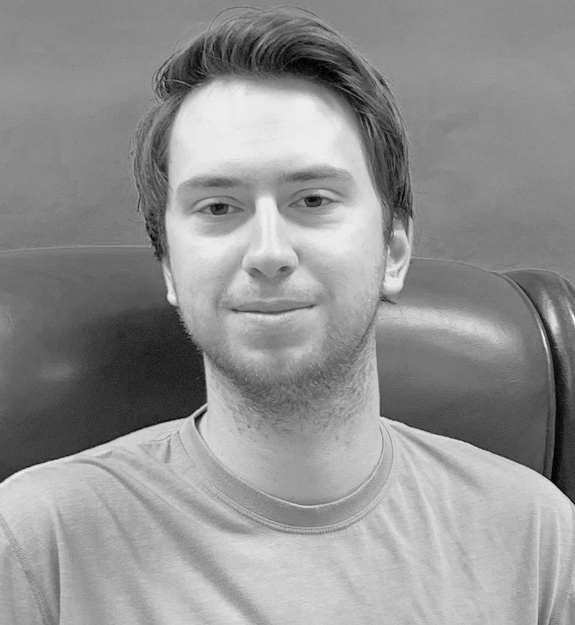 MERV 13? Today we’re talking about MERV. Not the Turkish City Merv, Not American baseball player Merv Connors, and definitely not Merv Tweed, the Canadian politician. We’re talking about Minimum Efficiency Reporting Value. This MERV is the rating scale for the quality of air filters, and believe it or not, there is a very wide range. Minimum efficiency reporting value is supposed to define the worst possible performance you can see from your air filter when dealing with particles within the range of 0.3-10 micrometers. Now that was some jibber jabber for sure. What does “worst possible performance” actually mean? Well we’re glad you asked! It comes from the testing method from which MERV ratings for specific filters are derived. Our good friends at NAFA (like NASA except air filters instead of spaceships, so much cooler) describe the process in detail here, but we’ll give you the abridged version. Particles at 12 different sizes within the 0.3-10 micrometer range are produced by fancy lab equipment and used to test filtration. The particles are then broken up into three different size ranges, each with four different sizes inside of them. Six tests at each particle size are conducted by spraying particles through the filter and measuring particle count in front of and behind the filter. The worst result for each particle size is used (hence worst possible performance) and those numbers are then used to generate a percentage. Finally, that percentage falls into a range that corresponds to different MERV ratings. 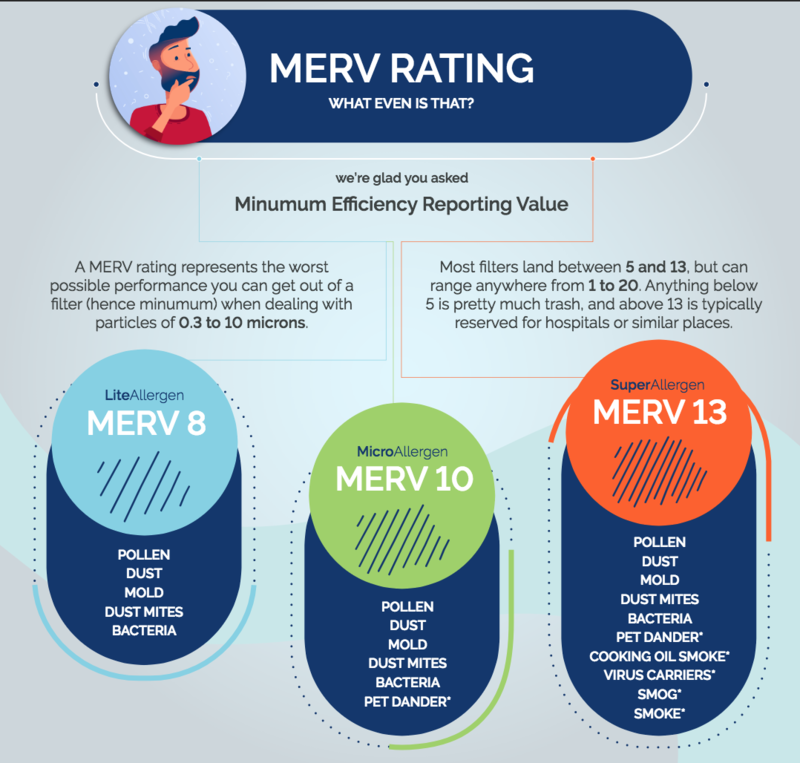 MERV ratings can go as low as 1 and as high as 20, however a 1 might as well just be a filter frame with nothing inside of it and anything below a 5 should be streamlined from the production facility right to the trash can. A 20 is reserved for hospitals, cleanrooms, and places of that nature. 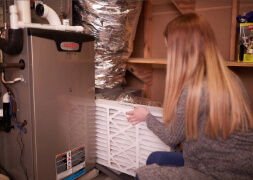 Filters used in homes and residential areas typically lie between 5 and 13, although an 8 is the minimum we recommend. A MERV 8, as defined by NAFA, will catch 70% or more of particles between 3 and 10 micrometers (range 3) and more than or equal to 20% of particles between 1 and 3 (range 2) micrometers. This will include lots of common pollutants such as dust, pollen, dust mites, and mold. A MERV 10 will catch more than 80% of particles in range 3 and more than 50% of particles in range 2. Particle sizes of all pollutants vary, but a good chunk of pet dander falls into range 2, which is why recommend at least a MERV 10 to all pet owners. A MERV 13 will snag more than 90% of range 3 and 85% of range 2 particles. It will also catch more than 50% of range 1 particles, which are between 0.3 and 1 micrometer. 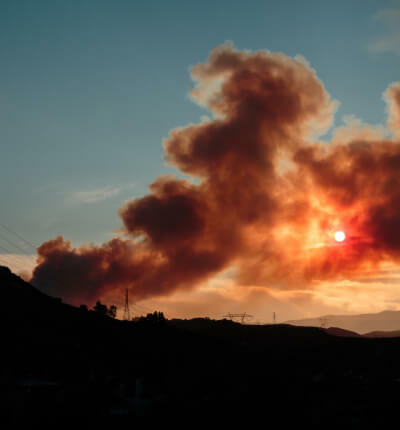 Most smoke and smog particles, which are common pollutants in many large American cities, fall under a single micrometer. Thus, a MERV 13 filter is often necessary in densely polluted areas. It’s also important to remember that MERV ratings are ranges, therefore not all equally rated filters are exactly equal. Two filters could have as much as a 14% difference in filtration effectiveness of range 1 particles and still both be rated as MERV 13s. And those are the basics of MERV, the incredibly exciting rating system for incredibly exciting air filters. We hope you learned something here today that can help discover your purpose in life and why you were born, or if not, at least maybe what kind of air filter you need. Spring tree pollen is either on its way or already here. 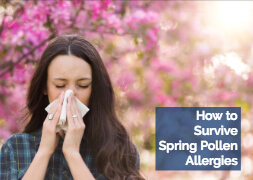 A little preparation can make it a lot more tolerable for all the allergy sufferers out there.